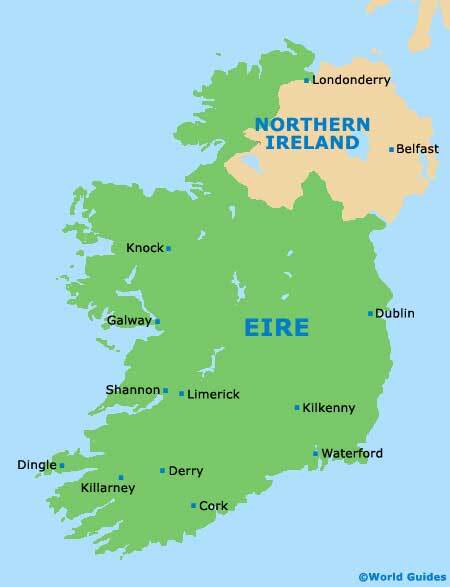 Ireland consists of two countries - Northern Ireland and the Republic of Ireland. Northern Ireland lies to the west of Great Britain and is the second largest island in the British Isles. The country of Northern Ireland is part of the United Kingdom and is made up of six counties - Antrim, Armagh, Down, Fermanagh, Londonderry, and Tyrone. Ireland has a wealth of accommodation to suit all travellers including budget lodging, travel lodges, bed and breakfast and luxury hotels. Visitors to Northern Ireland can enjoy a wealth of places to visit such as Belfast Castle, Stormont Castle, Inch Abbey, Bangor Abbey, Ballynoe Stone Circle, Belfast Zoo and the Giant's Causeway in County Antrim. Belfast is the second largest city in Ireland and Belfast is the capital of Northern Ireland. In recent years Belfast has undergone a dramatic redevelopment, which has transformed much of Belfast. Highlights in Northern Ireland include beautiful beaches, sporting venues, walking trails, museums, landmarks, monuments, festivals, carnivals, breathtaking scenery and quality shopping. Bordering Northern Ireland to the south is The Republic of Ireland, which has a long and rich heritage and tourists to Ireland will enjoy an array of historic places to visit that include Christ Church Cathedral, St. Patrick's Cathedral, Dublin Castle, Malahide Castle, Ardgillan Castle and Demesne. Dublin, Ireland's capital city, lies on Dublin Bay and overlooks the Irish sea that divides Ireland and Great Britain. The city of Dubin ranks among the top tourist destinations in Europe and has an abundance of tourist attractions. Other interesting places to visit in the Republic of Ireland include Cork, Derry, Limerick, Tipperary, Galway and Waterford - famous for its glass-making industry. Belfast is Ireland's second largest city and Belfast is the capital of Northern Ireland. In recent years Belfast has undergone a remarkable transformation and Belfast's economy is now booming. Many areas of Belfast have been recently been redeveloped. Located on the southern Irish coast, Cork is a relatively small city with much to offer its visitors. The skyline of Cork is an attractive one, with the spire of St. Finbarre's Cathedral being especially prominent and easy to spot. Filled with Irish character, Derry was formerly known as Londonderry and serves as Northern Ireland's second-largest city. Derry has managed to leave its troubled past behind and is graced by some 17th-century city walls. Dingle is the most-visited tourist destination residing on the expansive Dingle Peninsula. This charming town features a scenic Atlantic shoreline and a busy harbourfront, where sailing and windsurfing are popular activities. Dublin, Ireland's capital city, lies on Dublin Bay and overlooks the Irish Sea that divides Ireland and Great Britain. The city ranks among the top tourist destinations in Europe and in the last decade there has been an economic boom. The western coast of the Republic of Ireland is where you will find the city of Galway and its alluring pedestrianised streets. Galway's medieval Kirwan's Lane contrasts with its modern buildings and lively nightspots. A charming heritage city, Kilkenny (Cill Chainnigh) is more like a small town in its appearance. Those with a taste for history will likely appreciate the old buildings, a number of which were built during the Norman and Tudor eras. Lying on the south-western side of Ireland and within County Kerry, Killarney is a town with a thriving tourist industry, thanks to its close proximity to the Killarney National Park and its related sights, such as Muckross House. A sizeable coastal city located in western Ireland, close to Shannon, Limerick is very much a mixture of old and new. The city offers plenty to fill a few days, with the Viking heritage of King John's Castle appealing to many.